People have sought meaning in nature for centuries, yet only in the twentieth century did contact with wild settings become both institutionalized and readily available to ever increasing numbers of visitors. John C. Merriam (1869-1945) wanted the national and state parks in the western United States to be more than mere recreational outlets for visitors from an expanding leisure class. These travelers have been described by others more recently as "scenic voyeurs," content with observing sensational landscapes and often validating their journeys through souvenirs and photographs. Merriam associated himself with a movement to save the last coast redwoods in northern California, but he also redefined how other parks centered on remnants of the geological past were perceived. Because he insisted that intellectual curiosity and an individual's search for meaning be the focus behind the public park as an institution, Merriam occupies a unique place in the pantheon of defenders of parks and other wild places. Although strong willed and highly competitive, Merriam often recalled his boyhood, spent in a small Iowa town, in tones that echo the English romantic poet William Wordsworth's verse about the child being the father of the man. Merriam likened the experiences of his early years to the "natural piety" that Wordsworth so often celebrated, yet they also pushed him toward a career in science. From Iowa he went to the University of California, Berkeley, and eventually to Washington, D.C., first as a professor of paleontology and then as president of a foundation devoted to scientific research. His personality could best be described as austere yet articulate, his climb to national prominence helped less by his scientific credentials than by his capabilities as a man who knew how to seize an opportunity. He frequently turned to nature for reflection and inspiration, such that he could be both loner and leader. Merriam's protégés and associates in the preservation movement frequently wrote about the power of Merriam's ideas and his commitment to bringing about parks managed primarily for the education and inspiration of visitors. Merriam's efforts on behalf of several national and state parks were part of a desire to continue the teaching he had pursued for twenty-six years as a professor at Berkeley, but in a setting other than a university. Parks made better venues than a lecture hall, Merriam believed, for allowing people to see how nature reflected a divine hand, yet had also evolved from a dimly perceived past. As the most active among three cofounders of a conservation group called the Save-the-Redwoods League, Merriam embraced what he saw as an opportunity to help visitors appreciate how a redwood grove represents continuity between life on earth now and how it was millions of years ago. Even if some ancient plant and animal species had given way to those presently occupying the forest, he said, ancient redwood trees could render the geological time scale comprehensible to visitors who contemplated the past according to a human time scale. This rationale translated into action as the league's program to buy redwoods from private owners (usually lumber companies) became a conduit for establishing a string of state parks in northern California during the 1920s and 1930s. The league's acquisitions gained so much momentum that Merriam, along with league officials based in California, spurred passage of a state bond measure in 1928 by which the state provided money to match private donations to purchase stands of ancient redwoods. This measure laid the foundation for a state park system to grow and eventually rival what entire nations have accomplished in preserving their heritage. With that bond measure in place, Merriam helped to secure Point Lobos, a site four miles south of Carmel, for California's state park system. This site contained another living remnant of distant geological time, the Monterey cypress, which struggled for survival along a spectacular stretch of coastline. When trampling and disease threatened to damage the small cypress grove at Point Lobos, Merriam secured Carnegie grants to orchestrate the scientific studies needed for more effective management of the new park. The studies represented both a precedent and template for future efforts to preserve particularly sensitive places, and they expanded the scope of planning efforts into new and scientifically grounded dimensions. Instead of merely directing where facilities and other developments might be built, the master plan for Point Lobos, with science as its basis, set a laudable precedent for other parks to follow. Merriam's paleontological discoveries in the John Day Basin of arid eastern Oregon made him an advocate for the establishment of two state parks there as well. A proposed park in the basin's Painted Hills held fossilized redwoods that made something of a tie to the league's work to save modern redwoods in California.1 An even greater showpiece of life from the Tertiary period (sixty-five million years ago to two million years ago), Picture Gorge, lay thirty miles east of the Painted Hills. In wanting to underscore the relevance of cooperative research that he and others had undertaken in the basin, Merriam conceived the idea for an oblong park extending from the John Day River all the way to the rimrock that delineated this portion of the valley. Merriam hoped a state park centered on features such as Picture Gorge, Sheep Rock, and the Blue Basin might allow visitors to meet scientists who were working at various fossil localities to reveal the geological past and its meaning. Much of this preservation effort took place after he retired, and it remained unfinished when he died, but Merriam set a precedent for linking Oregon's state parks with its university system: he fostered the creation of an officially sanctioned committee, composed largely of university researchers, that sought to guide land acquisition and educational outreach in the parks by publishing a book that "interpreted" nature in the basin, a guide akin to the one Wordsworth wrote in his effort to preserve his beloved English Lake District. Merriam's enduring relevance is tied to his contention that merely setting aside an area as a park and prohibiting certain uses within its boundaries—mining, hunting, logging, real estate development—does not make for adequate stewardship in the long run. The "highest values" expressed by each place should be studied, he wrote, so that their contribution toward educating and inspiring visitors could have a lasting impact and would not be obscured by commercial services. Merriam made use of his toehold in the National Park Service to study the educational possibilities in three national parks: the Grand Canyon, Yosemite, and Crater Lake. Each of these parks hosted an experiment to find out how to most effectively reach visitors with what the parks represented as windows on the forces shaping life on earth. Merriam thought that people might truly support the parks if the Park Service could reach them through educational opportunities found nowhere else. By giving preservation this more exact meaning, Merriam also wanted to protect the characteristics that made national parks worth establishing in the first place. He pointed out that allowing commercial development to accommodate more and more people in the parks could lead to distortions in management priorities and ultimately the loss of the primary values that were meant to be preserved. Paleontologists are not generally known for their work as citizen activists, but this "blueprint" for preservation became Merriam's major focal point, particularly after his research career had reached its zenith, in 1915. He made a name for himself at the University of California, Berkeley, in the field of vertebrate paleontology, largely in fulfillment of a childhood ambition to be both a naturalist and a scientist whose work added to a general understanding of how life on earth had developed. When he moved into preservation work—and especially once he assumed the presidency of the Carnegie Institution of Washington, a privately endowed foundation supporting scientific research—he brought the lessons learned in his field of study with him. Paleontology is heavily interdisciplinary, and Merriam employed a team approach in his efforts on behalf of state and national parks. He appointed committee members to tackle the various facets of preservation that interested him, especially where scientific studies were needed. Because these committees, composed of technical experts, were external to the agencies that managed the state and national parks, they could function like independent advisory boards whose findings could be implemented by the operational branches of state and national park organizations. Merriam's insistence on basing his work for the parks on larger meanings assigned to nature reflected not only his academic orientation, but also a personality that valued order. In making intellectual curiosity his foremost aim in the parks, he swam against the current of promotional activity at a time when state and national parks were becoming focal points for mass recreation. This conflict between Merriam's preservationist blueprint and the promotion of natural areas as tourist attractions arose with the increasing mobility of American society during the early years of the twentieth century. Merriam knew that the ability to get around with relative ease on the country's expanded road and rail network allowed more people to enjoy recreational opportunities, but it also made the importance of managing for the higher uses of the parks more acute. He often used the word primitive in reference to parks, a term whose meaning was akin to what we call wilderness today. It also suggested a ready link to a past that preceded the appearance of humans. The education and inspiration of visitors to the parks thus assumed an even greater importance, since this emphasis could lead to greater numbers of people seeing the primitive and its protection as valuable to understanding, or at least appreciating, the distant past. Along with words like pristine and restoration, the term preservation is deceptively concrete. Although completely halting biological change is neither possible nor desirable, preservation involves a conscious decision not to extract commodities from a piece of land, much less convert it to agricultural or industrial use. Use may be largely recreational when land is set aside as public property, but there is also tension between the natural values supposedly preserved and the cumulative impacts associated with providing visitor access. How to resolve that inherent conflict deeply concerned him. Merriam was in the best position to apply his blueprint for preservation while he served as president of the Save-the-Redwoods League, from 1921 to 1944. The organization raised millions of dollars, often in combination with matching funds supplied by state bonds, and formulated plans for four projects—the parks that later became known as the Humboldt Redwoods, Prairie Creek, Del Norte Coast, and Jedediah Smith state parks—as well as a parkway called the Avenue of the Giants. Although he was in Washington, D.C., much of the time, Merriam, as founder and head of the league, directed its course with help from officers such as the secretary, Newton B. Drury. The two men usually corresponded about league projects and other business several times a week, with the diplomatic and affable Drury acting as a sort of foil for the gruff and often uncompromising Merriam. Drury used his experience in the league to good effect, later becoming director of the National Park Service (1940-1951) and chief of the Division of State Parks and Beaches in California (1951-1959). By having a hand in establishing the redwood parks, Merriam used his influence to help shape development and use of the fledgling California State Park System. He helped set the tone for a "rational" system of parks, with each individual site to emerge from a survey of the state conducted by the renowned landscape architect Frederick Law Olmsted, Jr., during 1927 and 1928. After the state acquired each site, Merriam wanted the master plan for each park to be guided by the necessary studies and statements about what constituted their "highest uses," which would guarantee adequate protection. Nevertheless, subsequent administration of the parks has required something of a balancing act by managers, especially in parks where preexisting patterns of use resist the most well conceived changes envisioned in planning documents. Resistance to Merriam's stance on the preeminence of education and his insistence on not compromising the primitive qualities of the parks' main features was greatest in the national parks. This is perhaps understandable, given how the early national parks, and the National Park Service itself, came into being. As a federal agency created by Congress in 1916 in response to the growing economic importance of recreational tourism, the Park Service, as well as its supporters, cast the national parks as public resorts. To garner and then keep enough political support for annual appropriations to the agency, the Park Service needed to project the idea that tourism in the parks possessed greater net value, even in the short term, than alternative uses such as mining, grazing, and logging. The Park Service had to promote the parks as worthy destinations for tourists, and provide ready access to them, since more visitors meant an increased number of constituents whose support could be demonstrated to Congress. Still, appropriations for the national parks were lean, which made for a thin field staff with a generalist orientation. Specialists in forestry, landscape architecture, and engineering remained comparatively few and tended to work from central Park Service offices in San Francisco or Washington, D.C. Beginning in the 1920s, Merriam championed the addition of academically trained staff assigned to education and research in the parks. One of his aims was to redirect the main thrust of park operations away from law enforcement, facility maintenance, and regulation of privately run concessions such as hotels and restaurants. The Park Service did accommodate what came to be known as "interpretation," and it tolerated research, but Merriam failed to push recreational tourism and its attendant manifestations out of central position in the agency's mind-set. Merriam opposed the paradigm characterizing the national parks as primarily public resorts, because tourist amenities like the dance halls, pony rides, and skating rinks in places such as Yosemite Valley impaired the possibility for inspiration to remain at the forefront of visitor experience. In his view, a national park should be a "super-university of nature," where the emphasis of operations lay in the story each place could tell, a story that visitors could retain when they returned home. The explosion in recreational use of the parks came after Merriam's death, though all the preconditions for it existed during the 1930s. In the post-World War II era, yet another paradigm arose for the parks. Americans now had more leisure time, and that, combined with a soaring population and mass access to automobiles, prompted a perception of nature as a patient whose health had been put at risk by the heavy consumption that comes from affluence. According to this new paradigm, a national park could play a role in warding off impending environmental crises in regional ecosystems by acting as a refuge for endangered biota. Both visitor access and the potential for inspiration took a backseat, in this paradigm, to conservation strategies formulated to maximize potential habitat and allow for wildlife migration corridors. Such biocentric emphasis in management would probably have struck Merriam as too extreme, since he saw parks as valuable primarily for how they inspired visitors. Public parks in the United States were inspired by such European antecedents, the first example being Central Park, which opened in New York City in 1857. As they had on the other side of the Atlantic, "landscape architects" played the key role in designing these spaces. Frederick Law Olmsted, who created Central Park, became their dean. Other city parks quickly followed, many of them designed by Olmsted and his assistants, their spread fueled by shared beliefs about the health benefits of fresh air and exercise in "natural" settings. The idea of creating public parks beyond city limits can be attributed both to the gradual closing of uncontrolled frontier areas and a growing acceptance of the idea of traveling to experience nature. Tourists became essential to this new type of park, once again predicated on the notion of finding landscapes that resembled paintings. By the end of the nineteenth century, many tourists had expanded their pursuit beyond the search for the merely pastoral or beautiful. They sought the sublime, an experience with religious roots that aroused sentiments of awe and reverence beyond full human comprehension. During the nineteenth century, scientific discovery of seemingly harmonious "laws" governing how the earth had formed gave Americans on tour of the western states a geologic focal point. In places such as Yosemite or the Grand Canyon, visitors not only contemplated sublime spectacles, but also could see them as scenery derived from a distant past. In 1872 Congress moved to establish another public park, this one to be managed by the federal government, containing some two million acres near the headwaters of the Yellowstone River, in Wyoming. Yosemite and Yellowstone possessed striking geological features in abundance, ones that lured visitors to experience firsthand the scenes already scripted by painters and photographers. The government supported tourism to these areas, if only in a tentative way, in large part for economic reasons. Because the parks had been carved from federal land that might otherwise have been sold, it was thought by some that national public parks could—and perhaps should—become self-supporting by charging admission. Moreover, the business of transporting and lodging tourists could have a beneficial overall effect on a fledgling western economy. In the nineteenth century, images produced by landscape painters and photographers stimulated the interest of the few who possessed the means to travel for pleasure. So did natural history, since this pursuit centered on the notion that knowledge and experience could be broadened by future journeys or reinforced by study at home.7 Tourists in nineteenth-century America found themselves in need of interpretation in order to decipher the spectacular natural phenomena they saw in person or in photographs. One way to make wild places like Yosemite or Yellowstone intelligible was through the natural history essay, a genre of writing whose popularity largely stemmed from the belief that through the aid of some scientific knowledge, nature could be explained as a story. Muir remained a compelling figure at the forefront of the movement for nature preservation in the United States. He founded the Sierra Club in 1892, and it had expanded to become a powerful force for preservation by the time Muir died, in 1914. As the club's president, Muir preferred to lead hikes instead of handling the mundane aspects of administration. Other members, such as William E. Colby, could pursue those tasks with greater energy. Muir's considerable personal charisma made him a popular dinner guest, even if he dominated polite conversation with a repetitious mountaineering story or a polemic on the necessity of saving forests in the Sierra. Muir could afford to be a strident preservationist. He had acquired a small fortune through shipping fruit grown in California to market in Hawaii.9 The luxury of remaining an amateur naturalist and writer also freed Muir from the burden of having to maintain his scientific credibility by contributing to scholarly journals. Merriam, more than a full generation younger than Muir, resembled Muir in only a few ways. Both were prolific writers, though most of Merriam's work appeared in scientific journals, read only by small numbers of practitioners.10 Muir's advocacy came through his depiction of the Sierra and other mountainous regions as wild gardens where visitors could hike or climb. Merriam focused more on the appreciation visitors could derive from finding evidence of how the geological past influenced the present. Where Muir could describe the Sierra as a resident (he spent all or part of each summer there from 1869 until his death), Merriam linked beauty and time with sublime landscapes of a wider geographic breadth from the perspective of someone who visited for a few days at most. Merriam, on the other hand, liked the idea of states managing parks that, in some instances, possessed national significance. Although a political conservative, he thought such sites could become part of a state's "educational program" as a kind of open-air university. The national parks had their place, of course, and Merriam emphasized how they could lead the way in adult education with naturalist programs aimed at inspiring visitors. But he disparaged the militancy engendered by "causes," preferring instead to organize committees loaded with technical experts who could then settle important questions of policy and management outside the political arena. The two men, who knew each other only as acquaintances, each served as head of the preservation group he had started for more than two decades. Some people joined both organizations, but Muir's Sierra Club remained recreational in its orientation, and its scope was broad with respect to the issues the club tackled. Much of the club's work consisted of pressuring government bureaus to preserve areas already in federal ownership. Merriam, as head of the Save-the-Redwoods League, made sure the group kept its main focus on fund-raising so that acquisitions might eventually be transferred to the state as parks. He actively helped the league define its aims and priorities on each park project so that funding could be used the most expeditiously in each negotiation with lumber companies and private owners. A nonconfrontational, ordered approach to building parks became the hallmark of the league's work. More than almost any of his colleagues and protégés, Merriam personified the aloof, though public-spirited, professional scientist. His demeanor and dress were formal (he sometimes collected fossils wearing a suit), though Merriam retained some quirks, such as repeatedly brushing real or imagined dust from himself. A hat generally covered his balding head, where he took pains to comb over some strands of hair. A graying mustache and a small goatee accentuated Merriam's facial appearance as he aged. His slender build and medium stature did not strike his contemporaries as physically imposing, but Merriam's grave, forceful personality, his intelligence, and his unbending will and determination to succeed impressed many people around him. Those traits alienated some people (he lacked what could be called a common touch), but Merriam also inspired the loyalty of others—generally talented protégés or associates with some political influence. Merriam's late-blooming interest in preservation came during his second career as an administrator. He remained a scientist and teacher over the course of his life, but Merriam is largely remembered as the longtime president of the Save-the-Redwoods League, a role that gave him an effective public forum, if one without the celebrity status Muir enjoyed. Dedication ceremonies for what became the largest park in the redwoods are thus highlighted in chapter 1, because they allowed Merriam to publicly express his vision as a preservationist. His career in science consumed most of his energy until he reached middle age, so chapters 2, 3, and 4 are presented chronologically. As Merriam's trajectory shifted from research toward administration, however, this profile of the preservationist becomes complex enough to warrant a topical treatment, which begins in chapter 5 with Merriam taking an increasingly active role in saving the redwoods of California. 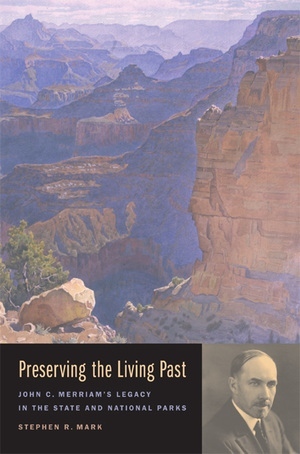 His involvement with parks and preservation widened beyond his focus on state parks and the Save-the-Redwoods League during the 1920s, so it makes sense to keep discussion of Merriam's role in bringing about an educational program in the national parks (chapter 6), separate from his perspective on wilderness (discussed in chapter 7) and his work to establish state parks (the topic of chapter 8). How Merriam articulated a guiding philosophy for preserving nature serves as the conclusion, mainly because it is in this realm that his blueprint has provided a lasting legacy. Although preservationists have never really dominated the social and political realms of American society, they have helped to set aside an impressive number of parks and other protected areas for the benefit of current and future generations. These places can provide an array of public benefits, not the least of which is stimulating the curiosity of visitors about nature. In this regard, evidence of the geological past can provoke thought and lead to an ever deepening appreciation of nature's intricacies. In realizing what could be achieved through parks, Merriam saw it as his duty to provide guidance. He always aimed high, and Merriam knew he could fail, but Merriam succeeded in providing a vision that gave new meaning to the challenge of preserving nature. CIWFCarnegie Institution of Washington files, Washington, D.C.
JCMPJohn C. Merriam papers, Library of Congress, Washington, D.C.
1.These fossilized trees were deciduous, or "dawn," redwoods (Metasequoia spp. ), not Sequoia sempervirens; see Ralph W. Chaney, "Ancient Forests of Oregon," in Ancient Oregon (Eugene: University of Oregon Press, 2001), 22-33. 2.John C. Merriam, The Highest Uses of the Redwoods: Messages to the Council of the Save-the-Redwoods League, 1922-1941 (San Francisco: Save-the-Redwoods League, 1941). The essay first appeared as "Forest Windows" in the June 1928 issue of Scribner's magazine and was revised and republished as "A Living Link in History," chapter 4 in Merriam, The Living Past (New York: Charles Scribner's Sons, 1930). 3.Denis E. Cosgrove, Social Formation and Symbolic Landscape (Madison: University of Wisconsin Press, 1998), 142-60. 4.Susan Lasdun, The English Park: Royal, Private, and Public (New York: Vendome Press, 1992), 135-86. 5.Act of June 30, 1864 (13 U.S. Stat. 325); for more details, see Alfred Runte, Yosemite: The Embattled Wilderness (Lincoln: University of Nebraska Press, 1990), 21-22. 6.Frederick Law Olmsted, "The Yosemite Valley and the Mariposa Big Trees: A Preliminary Report" (1865) in Landscape Architecture 43 (October 1952), 17, 22-23; the passage is also quoted by Alfred Runte, "Prospect," Landscape Architecture 81, no. 3 (March 1991): 136. 7.Paul Shepard, Man in the Landscape: A Historical View of the Esthetics of Nature (New York: Knopf, 1967), 136. 8.John Muir, Our National Parks (Boston: Houghton Mifflin, 1901), 1. 9.Thurman Wilkins, John Muir: Apostle of Nature (Norman: University of Oklahoma Press, 1995), 159-68. 10.A full bibliography of Merriam's work can be found in Chester Stock, "Memorial to John Campbell Merriam," Proceedings Volume of the Geological Society of America, Annual Report for 1946 (Washington, D.C.: The Geological Society of America, 1947), 183-97. 11.Stephen Fox, John Muir and His Legacy: The American Conservation Movement (Boston: Little, Brown and Company, 1981), 144. Stephen R. Mark is a historian with the National Park Service as well as Adjunct Professor of History at the Oregon Institute of Technology. He is the author of Floating in the Stream of Time: An Administrative History of John Day Fossil Beds National Monument (1996). 1. Why Save the Redwoods?